For a capital, it’s amazing how small a city can be. Any that’s coming from someone who comes from a small place already! 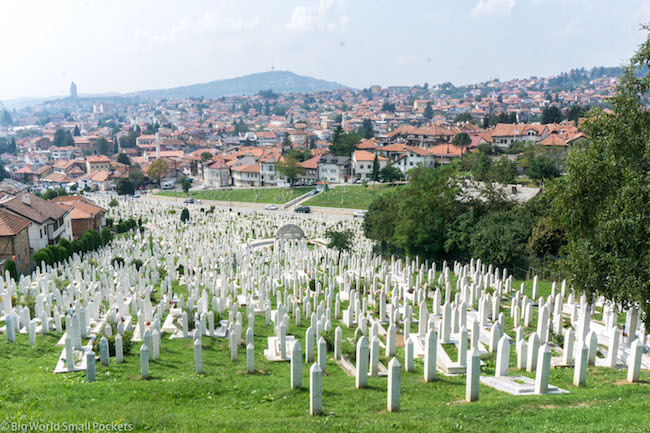 Yes the capital of Bosnia Hercegovina – Sarajevo – is more like a charming provincial town than a bustling metropolis and pretty much sums up the whole vibe in this country. Quaint, full of character, culturally fascinating and with an important history (both old and recent) Bosnia is a must on any Eastern Europe itinerary. Many friends who’d been there before told me I was going to love it… and they were right! 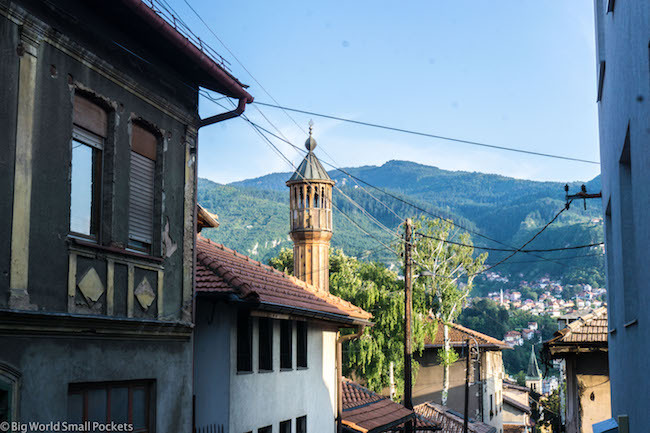 And top of the Bosnia itinerary list is Sarajevo, a must see during your time in this country and a great place to start your travels. Oh, and did I mention it’s insanely cheap too? 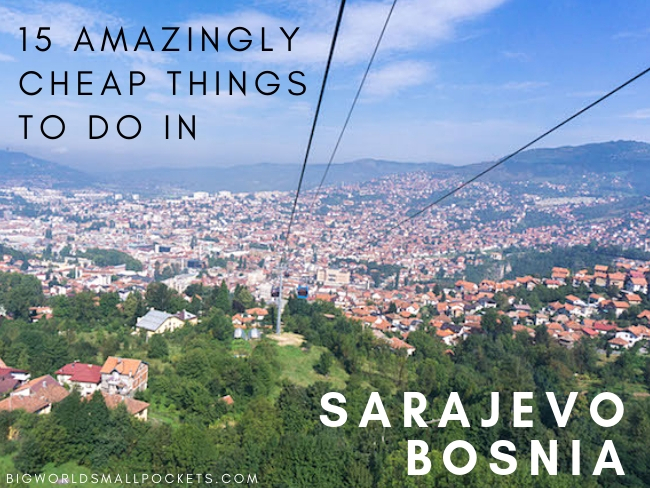 What more encouragement do you need people, check out the 15 amazing things to do in Sarajevo and get ready to add this city to your bucket list asap! This is always a must for me when I get to a new city, especially in Europe, but in Sarajevo – if you’re keen to understand the recent history and story of this city – it’s even more important. Running daily, both in the morning and evening during high season, any one of the free walking tours will provide a great introduction to this city, helping you to understand it a little more. And of course, they’ll cost you nothing except a show of your appreciation at the end. 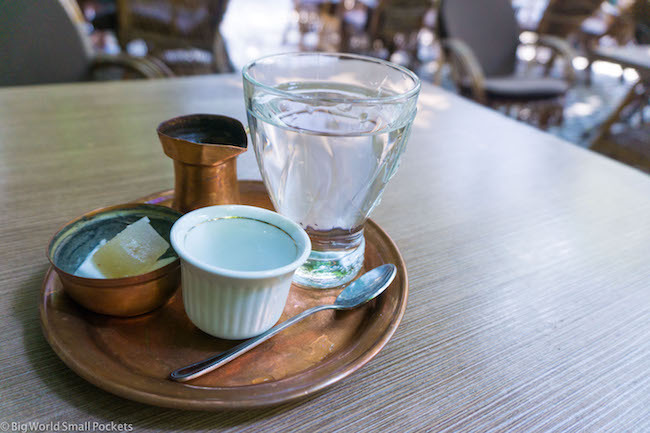 The Bosnians love a good coffee and a chat in my experience, so sampling this time-old combination in their capital is definitely on the best things to do in Sarajevo and a key way to get into the culture of this country. Turkish coffee is the order of the day here and there’s plenty of spots in the Old Town that can serve you up a good one for next to nothing – just head wherever the local crowds are. Otherwise, if you’re looking an espresso style coffee, then the Ministry of Cerjf is one of the most delightful cafes I found in the whole of this country and is well-worth checking out with its cute décor and outdoor mini-deck. Failing that Espressolab is a popular hangout for digital nomads and the like. 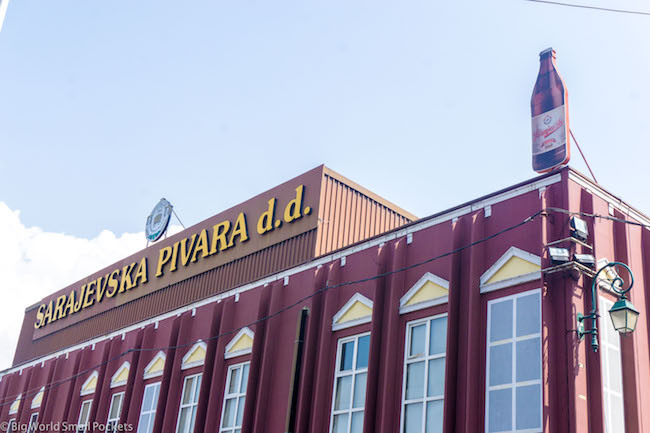 Located near the southern banks of the river, the iconic brewery of the capital is where the local stuff gets produced and heading here to sample some Bosnian beer is definitely one of the best things to do in Sarajevo. As well as a fascinating place to wander, and a great place to have a drink – especially in the evening – the Sarajevsko Brewery also has a fascinating history thanks to the natural spring below it, which allowed thousands of local people to survive when this city was under siege during the recent war. And Bosnia being Bosnia, the beers here are wonderfully cheap too! And it’s not just a coffee you should enjoy in the Old Town of Sarajevo. Nope these cobbled streets are also worth a morning of your wandering time as you head into the souks and down winding lanes to find yourself in the heart of what was once a key trading point in the Ottoman Empire on the way to Constantinople. Originally, each street was given over to the stores of a particular trade and, in part, this still remains, with the copperwork stalls still having an especially strong presence. However now the stalls are interspersed with cafes and restaurants, making this a great place to unwind over some delicious Bosnian food as well as souvenir shop. 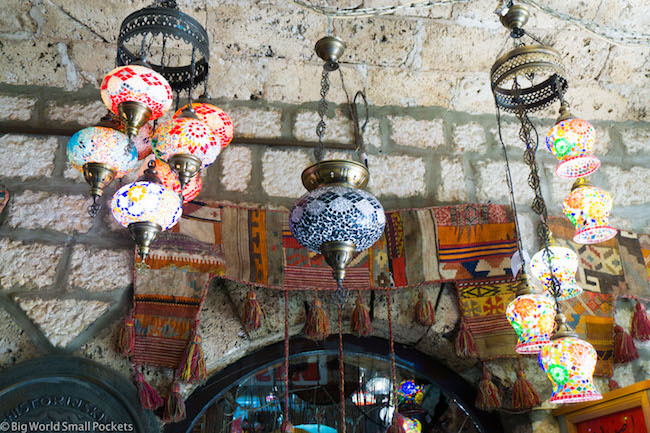 Despite being the heart of the tourist quarter, tons of locals still eat here too – so follow them to the best spots, or check out the amazing Snack Falafel cafe – I was in Middle Eastern heaven when eating here! Another one of the must do things in Sarajevo is hike up to take in the some of the best views of this city. The Yellow Bastion is the one closest to the city centre and is well worth the walk up to enjoy gorgeous views over the whole valley – especially at sunset. There’s even a nice café up here if you want to enjoy a drink or just some great walls to sit on with a picnic. Otherwise, slightly further away are the White Fortress and Biban’s Restaurant – both worth a look for the view too and, of course, they are all free. It’s probably one of the quirkiest things I got up to in Eastern Europe and it sounds like a bit of a strange attraction, but visiting the old Bobsleigh Track situated in some parkland in the hills above Sarajevo is definitely one of the most amazing things to do in this city on the cheap. Otherwise, if you can stretch to a few dollars, the cable car ride from the streets of Sarajevo up the hill provides insane panoramic views and is a lot of fun. 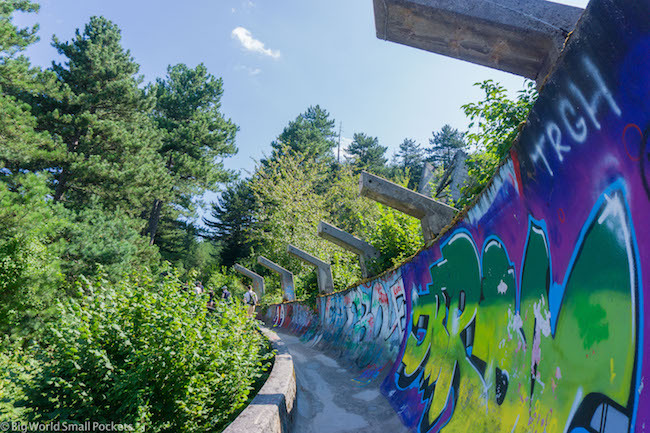 Originally built for the 1984 Winter Olympics which took place in Sarajevo – it’s stark reminder of how this city was before the conflict heralded by the break-up of Yugoslavia. And when it comes to the best hostel in Sarajevo, look no further than The Doctor’s House. Situated just slightly up the hill from the city’s main Cathedral and Square, this is a gorgeous homely place, with super friendly staff and great guest kitchen. I liked the short walk to get here from the centre too as it gave me the perfect opportunity to experience something other than downtown Sarajevo and to get a feel for a real local suburb. Check out the best rates for The Doctor’s House here. 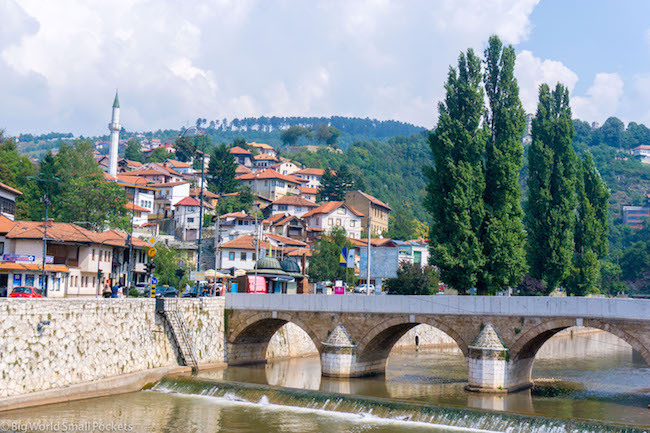 Set on the banks of a flowing river, no trip to Sarajevo is complete without strolling the water’s edge here to take in the lovely views of all the red-roofed buildings and pretty bridges. Small street stores line part of the river, where you can find a cheap coffee, or else enjoy some of the street art, as well as the spot where Franz Ferdinand was shot dead – kicking off the whole of World War I. 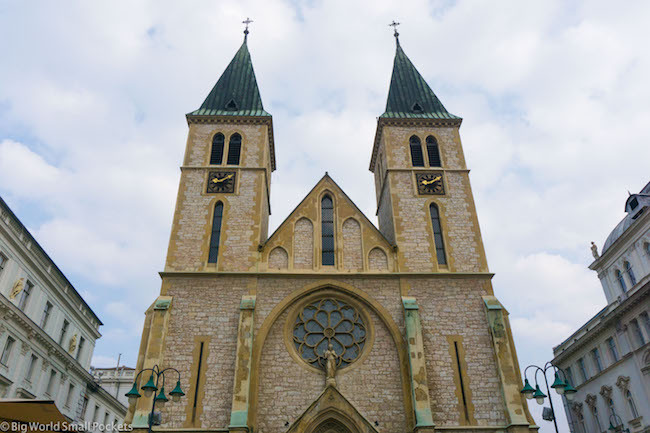 A country and a city boasting a diverse mix of religions as it’s transformed over time, this city is awash without different spiritual buildings and exploring this diversity is definitely one of the best things to do in Sarajevo. From the city Synagogue (now eerily quiet) to the Gazi-Husrev Beg Mosque, the Sacred Heart Cathedral and the large Serbian Orthodox Church, there’s a lot of history here to learn about. 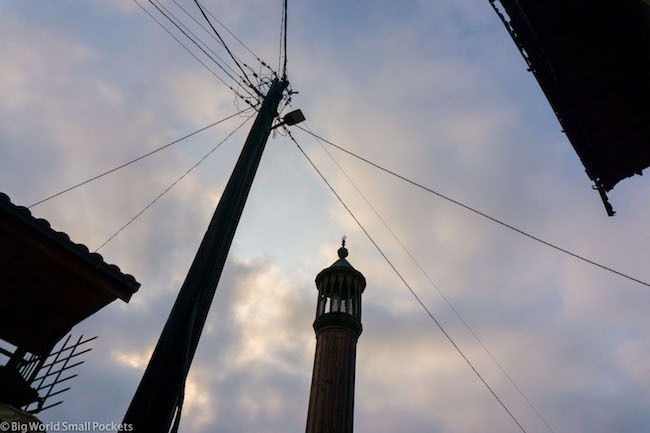 Often known as the city where east meets west, for me, the specialness of Sarajevo (in fact the whole of Bosnia) lay largely in this diversity which still feels very present. Learning about the history of this country and piecing together different parts of the puzzle I’ve experienced from travelling elsewhere in Eastern Europe and the Middle East was a very enriching experience. There are many direct flights available into Sarajevo’s international airport, although sadly I’ve not found many to be that cheap. A great way to save a few pennies however is to look at flights to “nearby” Belgrade, Dubrovnik or Podgorica instead. My go-to for bagging a cheap flight, check out Skyscanner to compare hundreds of different airlines and grab the best deal. I travelled to Sarajevo from Belgrade and used an excellent bus service to make this twisty-turning mountain journey. 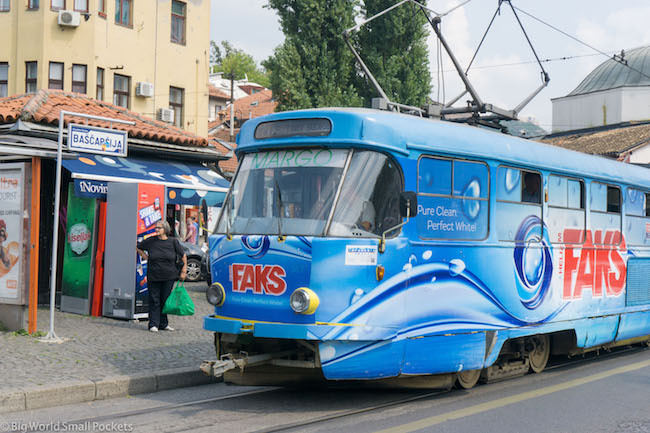 Booked on www.busticket4.me – this is a great website for budget travellers across the Balkans. 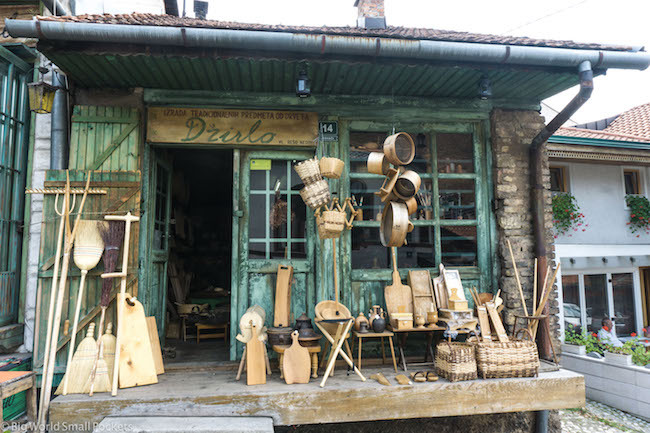 No time in a Eastern Europe capital is worth its weight in travel time without visiting at least one market and the Sunday flea market is absolutely one of the best things to do in Sarajevo on a budget. Set a little out of the Old Town centre, it’s easy to walk here or catch a cheap cab as it runs from 7am-12pm. If you’re not here on a Sunday, then some of the local suburbs around the Old Town have daily markets or, at the very least, visit one of the very local and cheap independent grocery stores that provide plenty of character as well as deliciously well-priced fresh produce. And my favourite of these suburbs had to be the Bjelave set just above The Doctor’s House hostel. In fact, just getting lost and wandering the streets of this hilly city will provide you with a ton of very authentic experiences in a great range of locales. Just bring some decent walk shoes and good calf muscles as the steep climb can provide a decent workout! 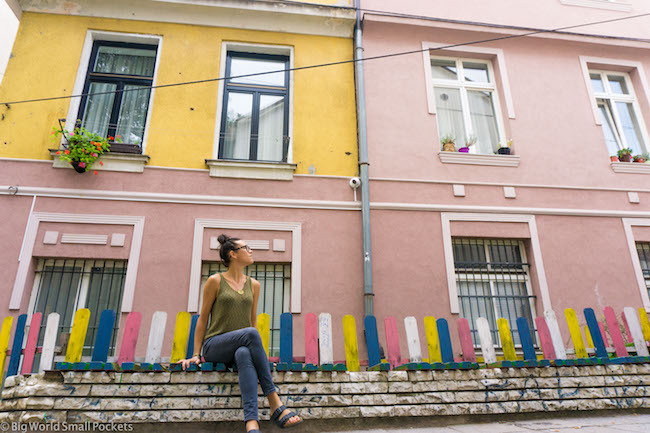 If you’re not feeling up to the hills, then Korvaci Street is a good way to get a feel of local life without wandering too far from the city centre. Definitely one of the best things to do in Sarajevo, this is another cheap activity that will give you a great feel for the city without costing the earth. 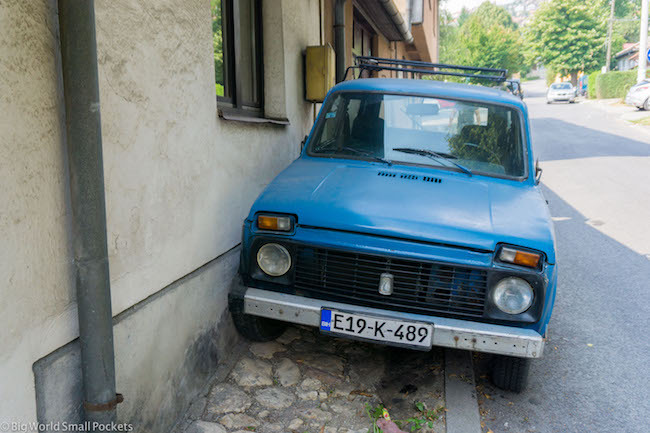 #1 Good Camera – You will be pretty much snapping non-stop during your Sarajevo itinerary and will need a good camera to do this quirky country justice. I highly recommend the Sony A6000, which I use for all my travels and love, not least because it’s light, compact and robust! #2 Good Walking Shoes – There will be a lot of walking in the city of Sarajevo, it’s as simple as that! Make sure your feet are comfortable therefore with a pair of New Balance Trainers. Perfect for stylish city strollling, I love mine. #3 Good Guidebook – I’m a massive fan of the Bradt Guidebooks when it comes to more off the beaten track spots and think their Bosnia Hercegovina edition is particularly well put together. #4 Good Water Bottle – All the city sightseeing is thirsty work, so make sure you have a metal water bottle that you can refill as you go, because Sarajevo tap water is drinkable… and free! #6 Travel Insurance – And finally, I wouldn’t backpack anywhere without coverage and have personally found travel insurance from World Nomads to be great for travel in Bosnia Hercegovina and beyond. If you like Turkish food, you’ll be in heaven here, and while vegetarians might not have the easiest ride, you’ll always find a spinach / cheese burek to help you through. Desserts are also big and cevapi are the order of the day. But best of all for me, was the ton of fresh fruit and veggies, which were all crazy cheap and no doubt organic – grown in a world where the use pesticides still isn’t common practice. 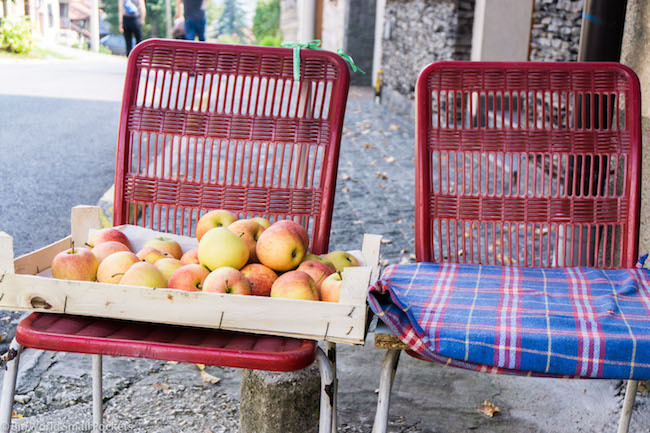 And talking of fresh fruits and veggies, sampling some at the fresh fruit market is, without a doubt, one of the best things to do in Sarajevo. The one closest to the centre is called Markale Open-Air Market and is located only a short walk from the Eternal Flame – Vjecna Vatra. And after all that eating, it’s time to relax on a nice patch of grass – preferably in the sunshine. 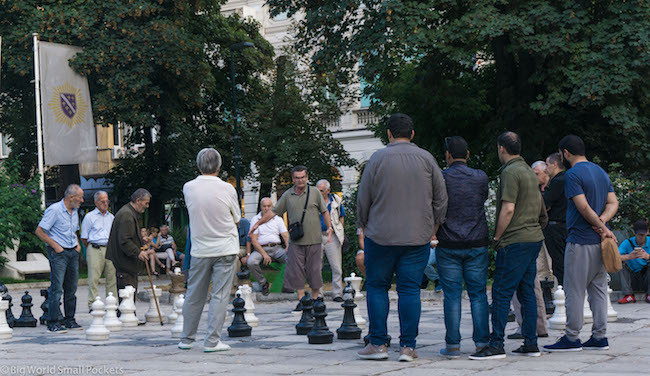 And what better spot that in Sarajevo’s Central Park – the perfect people watching spot and the ideal antidote to all that steep hill walking! It’s not just the Old Olympic Bobsleigh track that makes a great Sarajevo day trip, the nearby Skakavac Waterfalls, Goat’s Bridge, mysterious pyramids and bizarre bunkers are all worth some of your time too! 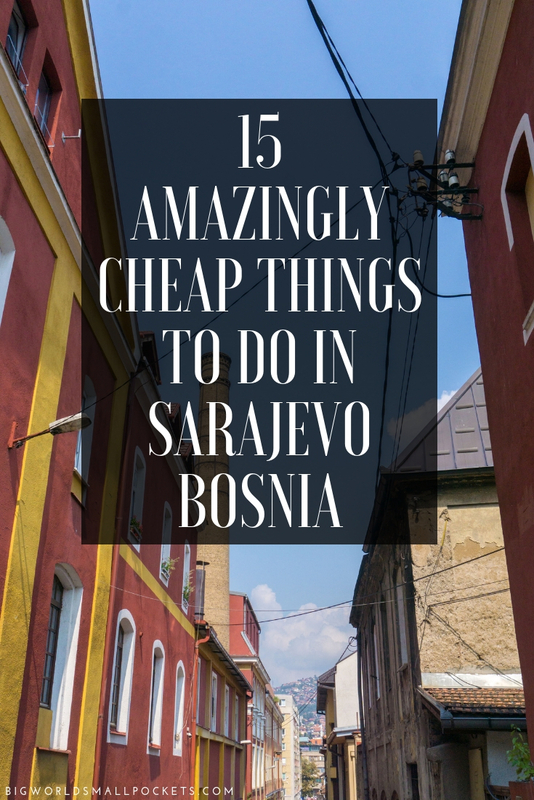 You could go to town, literally, checking out all the museums, galleries, exhibitions halls and cultural spaces there are in Sarajevo, but if you’re on a budget (or a quick timeframe) it’s probably best to limit yourself. So my top pick has to go to the Galerija 11/07/95 Srebrenica Exhibit. Incredibly powerful and hard-hitting, it bears witness to one of the most horrific events of this country’s civil conflict. 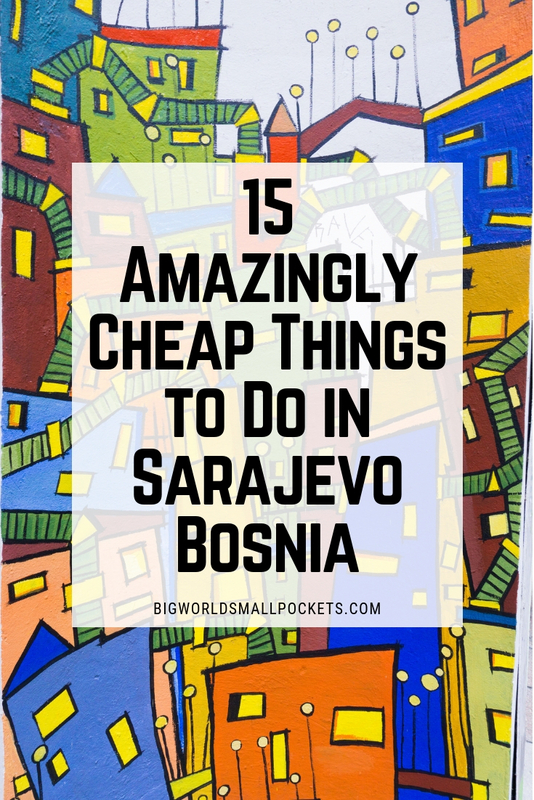 So there you have it, the 15 most amazing and cheap things to do in Sarajevo. How you been to this gorgeous city before? Did you love it just as me and what was your favourite thing to do there?